The Fujifilm Acuity LED 1600 II is a large format hybrid printer designed to give exceptional print results in the most environmentally friendly way. Fujifilm technology breakthroughs in LED UV curing, ink chemistry, and printheads work in perfect harmony to give smooth, near-photographic results at an impressive print speed of 355 square feet per hour. Print to roll for banners, window displays or backlit applications, and then seamlessly switch to directly print to rigid boards (including PET, acrylic and polycarbonate substrates) for high-quality POP or sign applications. Watch this brief introduction to the wide format Acuity LED 1600 II. High definition, accurate print with a range of finishes. Prints using easier-to-recycle media more and more customers are demanding. Lower utility bills by using 110V power, using a fraction of the energy of conventional curing systems. Instant print performance without a warm-up delay. 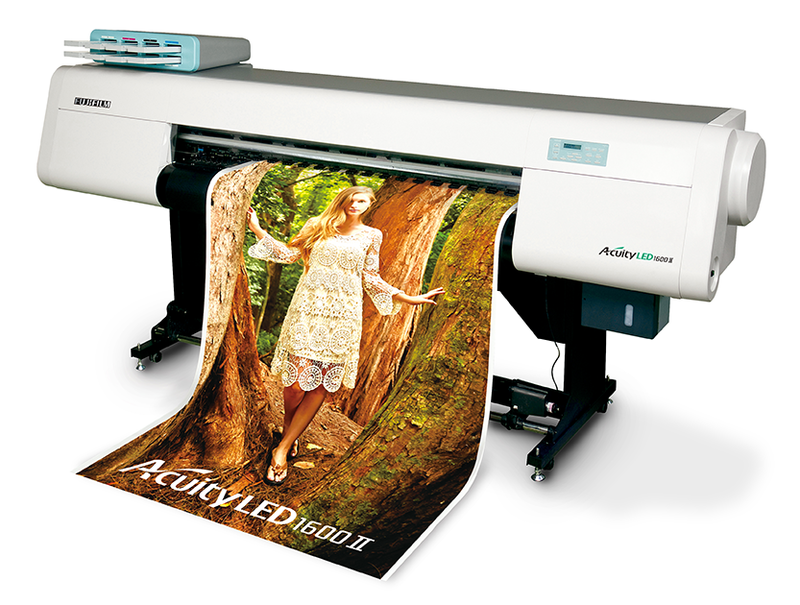 A true hybrid wide format, comfortable for both roll and rigid applications. The print tables have a unique folding compact design that takes up minimal storage space. Uses long life, low energy LED UV lamps. No wasted heat; no volatile organic compounds (VOCs) or ozone. Eliminates need for toxic metal halide lamps. Even the ink cartridge cases are reusable. The Acuity LED 1600 II’s patented full LED lamp curing system is precisely tuned to cure Uvijet ink in a two-stage process. Small, low-dose LED pinning lamps close to the printhead freeze the dot, while the main LED curing lamps fully cure the print which is ready to use right away. The Acuity LED 1600 II uses eight Fujifilm Dimatix Q-class, high frequency printheads for fast, precise and long-life, high performance production. The combination of VersaDrop multi-pulse jetting technology and accurate control of jetting, pinning and curing process, allows the Acuity LED 1600 II to produce unmatched print quality at surprisingly fast print speeds. The Acuity LED 1600 II has a dedicated eight-color UV LED ink set including both clear and white. Made using Fujifilm’s Micro-V ultrafine dispersion technology, Uvijet LL LED UV curable inks offer higher pigmentation, a wide color gamut and produce strong, vibrant images. Married to the Dimatix printheads, the Acuity LED 1600 II can apply colors, white and clear in a single pass. The Acuity LED 1600 II delivers with the AL 1600 RIP standard, but it also has compatibility with ColorGATE, Caldera, and Onyx.